So here’s something interesting. Remember awhile back where I yammered about how Dracorex and Stygimoloch might represent young growth stages of Pachycephalosaurus. I determined that Dracorex might be a juvenile of Stygimoloch, but that Stygimoloch is a distinct genus from Pachyrhinosaurus. This yapping was in response to a suggestion by Horner & Goodwin that the three genera might be synonymous. Well, just last week, they got around to publishing a paper in PLoS One detailing their interesting theory. They make a darn good case, noting that the spikes of the skull seem to be homologous across all three species. Also, interestingly, bone histeology reveals that Dracorex is a juvenile, Stygimoloch is a subadult, and Pachycephalosaurus is an old geezer. These are basically the two lines of reasoning that Horner & Goodwin use to synonymies the three genera under Pachycephalosaurus (well, along with the fact that all three are from the same place and time). I think there’s a great circumstantial evidence to suggest synonymy. However, let’s be honest here: the only thing we know for sure now is that Dracorex is a juvenile (of something), Stygimoloch is a subadult (of something), and Pachycephalosaurus is an adult. Really, the three species could still be entirely valid, or maybe just two. It’s not a great sample size, and time will tell whether this hypothesis persists or not. I think what would be very telling is to find, in association, Dracorex and Stygimoloch, or Dracorex and Pachycephalosaurus. Given that psittacosaurs and duckbills are big on family togetherness, you’d think such instincts would be present in pachycephalosaurs, too. Maybe someday we’ll find a family association of Pachycephalosaurus that will be a better test of Horner & Goodwin’s theory. 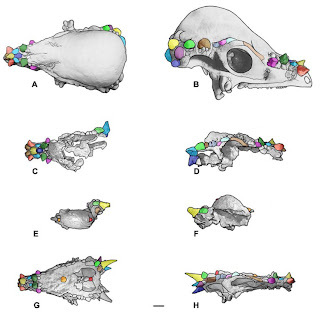 But the idea that Dracorex = Pachycephalosaurus has an interesting implication for Mongolia’s pachycephalosaur taxa. Andrea Cau mentions this on his blog, and I think it’s worth repeating here. Note the potentially-telling similarities of Homocephale and Prenocephale. I’m especially drawn to the scute patterns behind the eyes of both animals, and the shape of the postorbital fenestrae. This is hardly a rigorous observation, but it may warrant further investigation. Stygimoloch is distinct from Pachyrhinosaurus. I've never heard anyone claim otherwise. One's a pachycephalosaur, the other's a ceratopsian! Also note that the size of the skulls of Stygimoloch and Dracorex are exactly the same size. There is something unusual going on here, but I wouldn't spring for full synonymy just yet. Not to mention we need more speciments of Dracorex and Stygimoloch than one skull.